Melbourne is a large city with a population of around 4.2 million people. Melbourne is also spread over an area of about 2000 square kilometres. Like all big cities, people need to travel in Melbourne. Many people work in the city centre and each day they need to get to and from work. Still more people like to shop and visit the city centre. About 800,000 people use the city centre each day. Melbourne has a train system (Metro Melbourne), a bus system and also, for the inner city, a tram system. As well, many people still use their cars to get into the city every day. In this podcast, I will talk about the train system for our city. The train system, called Metro Melbourne, has 16 lines linking the centre of the city to most of the major suburbs of Melbourne. The lines are named after the final destination for each line. For example, the line closest to me is the Lilydale Line. Lilydale is a nice village on the edge of Melbourne’s north west. I often ride through Lilydale on my motorcycle rides into the hills around Melbourne. So this line is called the Lilydale line. The Metro Melbourne system is mostly above the ground. Only the small section which runs around the city centre is underground, passing through 3 underground stations. The main city stations are Southern Cross Station and Flinders Street Station and these are above ground. Flinders Street Station is an older style building and very interesting. Southern Cross Station is a new building and very modern. Each train station has Protective Services Officers. They are special police who only work on the Metro Melbourne train system. They ensure that Metro Melbourne travellers are safe. Melbourne’s train system is a generally safe system and people can use it safely right up until the last train. The last train from the city leaves at around midnight for most lines. On week ends, a bus service (Night Rider) runs after the last train to most suburbs. But I am always in bed by that time. To ride on Melbourne’s trains, you must have a special card called a ‘Myki’. There is no other way to pay for your travel on a Melbourne train. First you need to buy a Myki card (for $6) and you must ‘load’ some money onto it. You can buy a Myki card at any train station, at many shops (e.g. 7-Eleven) and from Myki self service machines at train stations. When you buy a Myki card, you can also ‘load’ some money onto it at the same time. It’s really quite easy. Every time you travel, you must ‘touch on’ at the Myki reader machine at the entrance to the station where you begin your journey. When you get off at the end of your journey, you must ‘touch off’ with your card at the Myki reader machine at that station. The Myki system subtracts your fare from the amount you loaded onto your Myki. I put $30 on my Myki when I first bought it. It costs about $5.50 to go from my nearest station into the City. That’s about 25 kilometres. So it’s not too expensive. Of course, at peak travel times around 5pm to 6pm in the evening and from 7.30am to 9am in the morning, Melbourne’s trains are usually full. But even at these times, I can always find a space to stand comfortably, or sometimes even get a seat. At other times, there will always be a seat for you. I hope that has given you some basic information about Melbourne’s train system. When you come to Melbourne, you should try it. If you have a question or a comment to make, please leave it by clicking the comments link at the top of this story. You can leave your comment in English or in any language and I will translate it. Or, you can send me an email at rob@slowenglish.info. I would like to hear any suggestions you may have. Goodbye until next time. Podcast 6 Quiz - Did you understand the podcast? True or False? – About 800,000 people need to go to the city centre in Melbourne each day in order to work, to shop or just to visit the city centre. True or False? – There are 16 train lines in Melbourne and they are named after famous people. True or False? – Rob lives in the nice village of Lilydale on the outskirts of Melbourne. True or False? – The Melbourne Metro Train system is an underground system. True or False? – Rob thinks that the new Spencer Street station is very interesting. True of False? – Protective Services Officers are at every railway station and help to keep people safe. True or False? – The Melbourne Metro trains run all through the night. True or False? 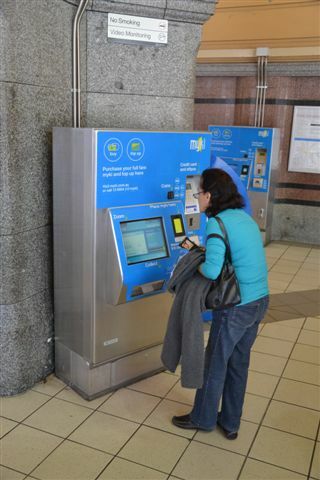 – You can use a Myki card or you can pay cash on the Melbourne Metro Train system. True or False? – Rob thinks that it is expensive to travel on the Melbourne Metro Rail system. True or False? – At peak times in Melbourne, you can often still get a seat on a Melbourne Metro Train. Entrance = the place where you go inside. Often a gate or a door. million = a large number. It is 1,000,000.
peak travel times = when there are lots of people travelling to and from work. self service machines = machines which you use by yourself. You serve yourself. 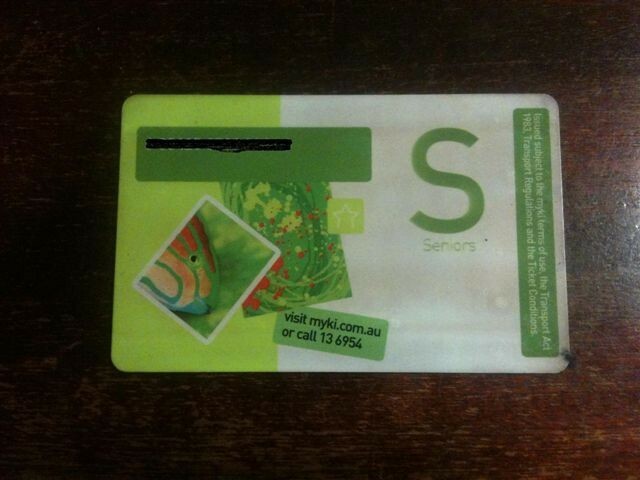 When I listened to this podcast of MYKI card I lost my MYKI card! Haha. But my friend give me a new one. Have a nice day Rob! Luckily it is easy to get another one. Hi, Rob. This is Nan, who is one of your fans. The reason that I like this podcast series is because when I felt tired, I was still able to focus on what you say in its content and the meaning of your words spoken out of your mouth can be absorbed in my mind, which affect my English and I got the sufficient marks in PTE exam eventually. Thanks very much. This is the best way to improve foreigners’ English when I noticed that some of them are likely to keep speaking as quick as they want without considering how much other people get the points of what they really mean. Many thanks for your kind message. I am very pleased that my podcast has been useful to you. Good luck with your English studies.